I had my one day post op after my second surgery. My vision was pretty blurry due to a bit of swelling on the cornea, so I’ve waited to share. Now when you decide on having a “lifestyle lens,” you really have to think about how you spend your time and what your particular vision needs are. Myself, I work on a computer and interact with patients. Ok, that’s 40 hours of my week. Typically, I’m awake about 122 hours in a week, so that accounts for 1/3 of my time. Driving: an hour a day. Family time includes reading, watching television, board games. Weekends are your typical housekeeping chores. Hobbies? Making quilts! Accurately measuring, cutting, sewing and pressing. Hand sewing the bindings on finished quilts. For me, being able to thread a needle and follow a line of stitching was vital. These Symfony lenses have the ability to let you see for reading, computer and driving. But super fine like I wanted required either cheaters (non-prescription magnifying glasses you find in a drug store) or, choosing a power for the implant that would provide that. Choosing that option may require glasses for driving. That is the choice I made. Right now, I’m threading needles and hand sewing along that line of stitching! My advice to those of you considering a Lifestyle lens? Evaluate your life! What are your visual needs? Communicate this to your surgeon. You may be an avid outdoor enthusiast, golfer, pilot or ham operator! Reading may be your passion. There’s as many lifestyles as there are people, each one unique and important. I still have a couple weeks for my vision to stabilize, but right now I have what I can only describe as “normal” vision. I’m seeing what I want to see. How awesome is that?!? One week later. Scheduled for a one week post op and second surgery. Depending on how your eye heals, your personal preference and the difference between your eyes, surgeries can be scheduled 1-3 weeks or further apart. I was fortunate to be 1 week. I have noticed a lot of struggle between my new eye and the other one this past week. It felt like the new eye was doing about 90% of the work and the old one was trying to keep up. Those floaters from the medication last week? They were gone 3 days after surgery. What was really cool was turning on my side to read in bed without my glasses getting in the way! The halos are much smaller around lights, more something I observe but not causing any difficulty, All in all, it’s been a great week between surgeries! My one week check up was great. Healing well, seeing 20/20 without correction. My biggest hobby is sewing quilt tops, so I’ve asked my surgeon to set my lens power for reading or “near” vision to help me with my hand sewing. My surgical experience was every bit as good as the first time. I even slept a bit before and during! I still don’t remember a great deal of what went on in the OR… and I can say that because I know what happens since I work there! The medication in my eye this time is more like a cloud over the outside half of my vision. I had a foreign body sensation which I knew was the incision from surgery, and artificial tears took care of that. I’ll check in again tomorrow and let you know how I am with the dilation gone. I’m still ecstatic with my surgery. I’m very proud to be a part of the Team at The Harman Eye Clinic. It’s a blessing to help others with improving their vision, and I’m one of many staff members who have experienced the benefit of various procedures we can do. iLASIK, Refractive Lens Exchange, Cataract surgery with an assortment of lens options. It’s all good! Getting ready for surgery day. I’m between the age of 60-65 with no health issues, so I was able to have the need for my MD to clear me for outpatient surgery deferred. After the schedule was set, the nurse sat and explained my pre-op instructions to me: morning meds with a sip of water, nothing to eat or drink past midnight, the need for a driver. They will start an IV, so I’ve got to drink lots of (hydrating) fluids the day before to ensure the best veins. Now, since I work in the Surgery Center, I volunteered to work until it was time for me to be admitted. The only problem I can foresee is a caffeine headache when my body realizes it’s not getting its daily dose. I went for years eating one meal a day, so I don’t see a problem with not eating until after surgery. I certainly don’t want to risk being nauseous while my eye is being worked on! I have been approved for what’s called “dropless” surgery. This means I won’t have to pick up any prescriptions for a set of eye drops (antibiotic, steroid & NSAID) to use before and after surgery. Instead, the medication will be placed in the back of my eye at the time of surgery. Thank goodness! While I’ve figured out the best way to put drops in my eye, remembering to do so 4 times a day would probably require hiring a personal assistant! My surgeon has told me I’ll need to be diligent in taking care of my dry eyes. For me, the hours I spend staring at computer screens has led to dry eyes. Seems I forget to blink! I do take fish oil every day as he’s recommended, which has certainly helped. But surgery will disturb the surface of my eye, so I will stock up on Preservative Free artificial tears for use after surgery. Plus, years ago I did have an injury to my left eye that has caused what is called “recurrent corneal erosion.” I used to have yearly flare ups, but since I started with the fish oil I haven’t had any problems. I’m aware this problem is ever present and I need to be responsible for constant care. Other than that, I think I’m ready! Imagine iLASIK working for you. The Harman Eye Clinic, in Arlington, Washington, invites you to stop in for a free, brief screening and meet-up with one of our surgeons. There is no pressure or obligation to have surgery. We are here to help you decide what type of vision lifestyle is best for you and whether you want to research further. No one is the same and we do not expect to treat you like everyone else. When you are ready either stop in (903 Medical Center Drive, Arlington WA) or call us at 360-474-2561 or 800-755-3937 and ask for a free screening. Make the most of your lifetime! Live Facebook , (tap here), is quickly becoming our newest path of communication for the Pacific Northwest community. Pam Miller, Refractive Consultant, connects with our staff and patients for a glimpse of what goes on in the background of The Harman Eye Clinic, in Arlington WA, before visiting our center. Join us! Get notifications of upcoming Live Talks with Pam by “liking” us at The Harman Eye Clinic Facebook page Patients tell us these are the best eye surgeons in the Pacific Northwest for iLASIK, Cataract surgery, and Lifestyle Lens Implants with cataract surgery! 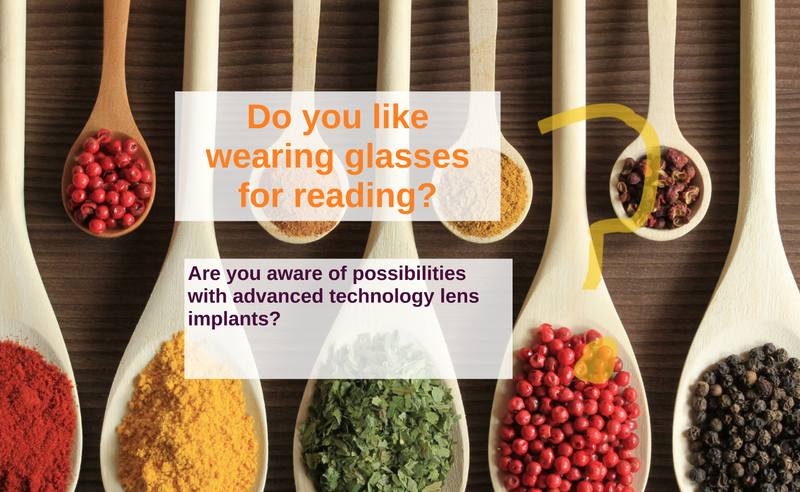 An extended depth of focus lens is an integral part of the Lifestyle Premium lens implant menu at The Harman Eye Clinic in Arlington WA. In 2016 the Food and Drug Administration approved two new types of intraocular lenses for use in cataract surgery—the and TECNIS SYMFONY® toric lens implants. “The Symfony® intraocular lens is the option of choice that I can offer my patients to improve their vision following cataract surgery, especially those who have difficulty focusing on objects at near distances because of presbyopia,” said Dr. Bajenova. The Symfony® lens improves intermediate (and in many cases near vision), thereby treating presbyopia. The Symfony® toric lens not only corrects presbyopia, but also astigmatism. During cataract surgery, the natural lens of the eye is removed, and an artificial lens, called an intraocular lens, or IOL, is inserted into the eye. Many patients still believe the only IOL available to them is a traditional monofocal lens, which only allows the person to see at a distance, with closer objects being out of focus. In contrast to the traditional, standard IOL, the Symfony® lens was specifically developed with features to improve both the range and quality of vision. Symfony® lens is successful because it provides a continuous range of focus for both distance and intermediate (computer) vision. Patients who continually require absolute fine detailed vision, such as accountants or those who like to read paper, small-print books in bed without glasses may appreciate a comparison discussion over Technis multifocal lens and Symfony®. These patients who have the Symfony® lens may choose over the counter reading glasses (+1.50 cheaters) for fine print. Others who require fine-print access leave behind need for reading glasses by using their computers, smart phones and pads, to do their reading in bed and fine print projects. It is important to discuss comparison options before surgery by sharing your lifestyle and vision expectations. The Symfony® lens also offers excellent quality of vision without loss of contrast sensitivity. Some patients who may not be a candidate for the Tecnis Multifocal lens due to, say, an epiretinal membrane (wrinkle in the macula) which may decrease contrast sensitivity, for example, may still be a candidate for the Symfony® lens. Presently, it is the only lens on the market that corrects chromatic aberrations, a feature that improves reading ability. The rings are larger than the Tecnis Multifocal lens, so that halos at night are much less prominent. Patients under the age of 60 tend to tolerate the Symfony® lens much better than multifocal lenses. Although the Symfony® lens is designed for bilateral implantation, patients with a cataract in just one eye seem to tolerate the Symfony® lens well, but the full benefits of reading are best when it is implanted bilaterally. A LifeStyle Worksheet is available for our patients so that they can prepare. Many patients come for cataract surgery consultations with little or no information about what we call LifeStyle lens implants. The Symfony® is one such lens. Much of the senior population have come to accept that glasses are a part of their life. Some will even say that they like wearing glasses. That is fine, if true. Patients who were eligible and chose to have a LifeStyle lens implant continue to tell us how grateful they are to get up in the morning, look out the window, read the time on their smart phone, and remember how good it is to see with little or no dependence on glasses. Symfony® and Symfony® toric lenses can offer quality of vision without loss of contrast sensitivity. The traditional lens implant for cataract surgery is a monofocal lens (vision for one point of vision). Reading glasses and glasses for intermediate vision is expected after surgery. To proceed with confidence, prepare by listing your lifestyle vision requirements and expectations before meeting your cataract surgeon. Download our latest, comprehensive Patient’s Guide to Successful Cataract Surgery, or request an appointment for a cataract evaluation and your surgeon will be able to address your questions on an individual manner after your eyes have been examined with an overall evaluation of your health, life-style and vision potential. Call The Harman Eye Clinic in Arlington today, the first step to life without cataracts. 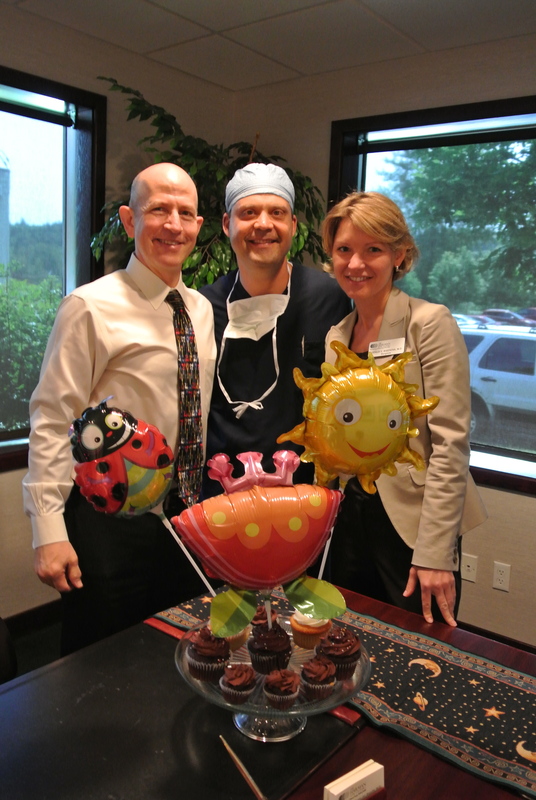 (July 2, 2014 — Arlington, WA) Cascade Regional Eye Center, Inc., PS, dba The Harman Eye Clinic, located at 903 Medical Center Drive, the premier eye surgery center in the Pacific Northwest for over 30 years, has acquired a new owner. 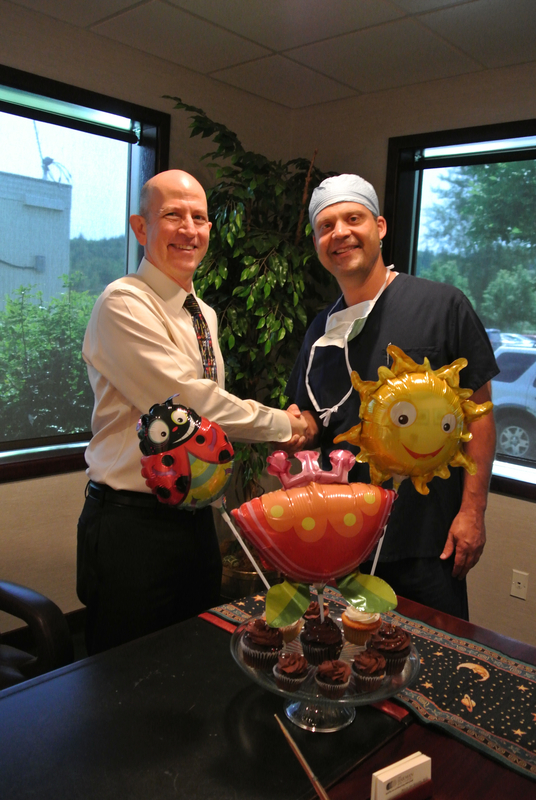 Bruce J. Ballon, MD has sold 50 percent of the practice to Bruce E. Wietharn, MD. The two doctors will alternately share the role of President and CEO annually in addition to their services as ophthalmologists and eye surgeons since 2002 and 2004 respectively. The purchase of this practice reflects a long-term relationship built over the past decade. Each holds the gold-standard of excellence, confidence, depth and continuity in personal service. Their partner, Natalia V. Bajenova, MD, joined the practice in 2012 and is slated to purchase one-third of the practice in 2022. Serving patients of the Pacific Northwest since 1984, The Harman Eye Clinic primarily provides advanced customized LASIK surgery as well as Refractive Multifocal Lens and Standard cataract surgery. Patients are customarily referred and co-managed through area eye doctors for surgery; however, patients may seek surgical solutions for their eye challenges through appointments. For more information about The Harman Eye Clinic and its services, visit www.20Better.com or All About LASIK, or call 360.435.8595.